FC Barcelona’s bid to become the first club to win five consecutive editions of the Spanish Cup took a dent last Thursday when Levantewon the first leg of their round of 16 tie. 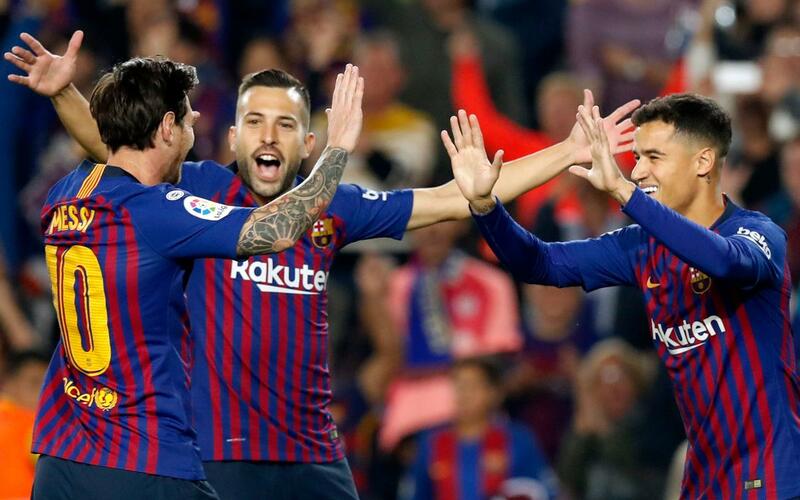 But there is no reason to believe that the Catalans can’t make amends for the 2-1 defeat when the sides meet again at 9.30pm CET on Thursday for the second leg at the Camp Nou (TICKETS HERE). Two goals would have been a much harder deficit to make up. But Philippe Coutinho’s last minute penalty at the Ciutat de Valencia lightened the burden considerably. An away goal always helps in two-legged encounters, and 2-1 away is a scoreline that Barça have only failed to turn around in one out of eight attempts in this competition. That was against Athletic Club way back in 1930. A repeat of nine of the ten results of games between Barça and Levante at the Camp Nou this century would be enough to see the blaugrana through to the quarter finals, while the other, a 2-1 win in 2011, would send the game into extra time. - This is the third time the teams have met in less than a month. Barça won 5-0 away when the teams met in the league, with Luis Suárez and Gerard Piqué scoring either side of a Leo Messi hat trick. - It is the third time this century that Barça have played Levante the Copa del Rey. In 2004, we won 4-1 on aggregate and in 2014 cruised through 9-2. None of the current squad appeared in the games 14 years ago, but Sergi Roberto, Jordi Alba, Sergio Busquets, Messi and Piqué all remain from the 2014 clashes. - Messi is just one goal short of the 49 that Ladislao Kubala scored in the cup from 1951–65. But he still has some way to go to beat Barça’s all-time top goal-getter in the competition, Josep Samitier with 64 from 1919–34 and even more to catch Telmo Zarra, the overall top scorer with 81 goals for Athletic from 1939–57. Levante have earned just one win from their last six Liga fixtures, so their cup victory came as a breath of fresh air. After an encouraging run early on, their form since November has seen them drop back down into the lower half of the table. Manager Paco López is returning to Camp Nou for the first time since 2008, when his Benidorm side exited the cup by the impressively narrow margin of 2-0 on aggregate. “It was Guardiola’s first year and we even had chances to win before Messi scored a penalty right at the end” he remembered this week. The coach had plenty of praise for Thursday's opponents in his pre-game press conference the day before the game. After the team's final session before Thursday's game, Valverde named the following players for his squad: Ter Stegen, N. Semedo, Piqué, I. Rakitic, Sergio, Denis Suárez, Coutinho, Arthur, Suárez, Messi, O. Dembélé, Cillessen, Lenglet, Murillo, Jordi Alba, S. Roberto, Aleñá and Vidal. For those fans lucky enough to have tickets for the game, there's some great news. The city's metro service will be running late until 1.00am to make sure everyone can get safely home after the match.